China Residencies is excited to announce the first open call for “Two to Three”, a program which will send three Australian artists to China for 4-8 weeks on funded residencies (covering flights, visa, accommodation, and a stipend) at partner organizations in second and third tier cities. TCG Nordica in Kunming, Yunnan is driven by a very active and thoughtful staff that has built strong ties with its surrounding community, including a relationship with the local minority university. Organhaus in Chongqing, Sichuan has a reputation for promoting emerging contemporary artists and experimental work. It has strong connections to the local university, and active programming. Dongdong + Lulu Artist Residency in Hohhot, Inner Mongolia is hosted by internationally acclaimed Chinese contemporary painter Shen Jingdong and his wife Lulu. It is the first artistic program of its kind in the Inner Mongolia. 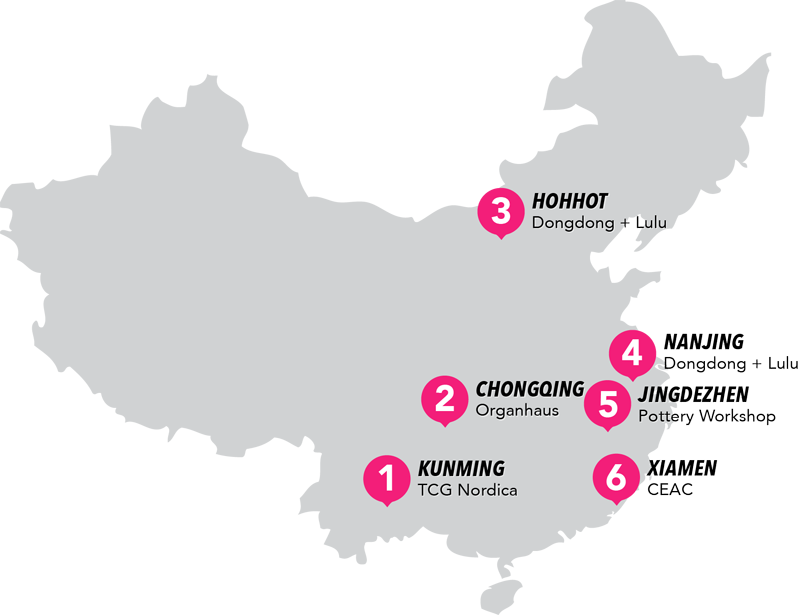 Dongdong + Lulu Artist Residency in Nanjing, Jiangsu is also hosted by Shen and Lulu and as a result has strong ties to the Chinese fine art community as well as students and the public. The Pottery Workshop is in Jingdezhen, Jiangxi also known as “Porcelain Capital” thanks to its 1700 year history with the medium. This program is dedicated to the practice of ceramic arts and has incredible dedicated facilities to clay work. Chinese European Art Center (CEAC) in the port city of Xiamen, Fujian has been inviting artists for over a decade to give lectures & workshop in local universities and exhibit work at in their private gallery space. Application fees are not required, however we are requesting a suggested donation of USD$25 to support administrative costs for this initiative as well as the not for profit mission of China Residencies. Applications are due by June 20, 2014 (recently extended) and selected applicants will be notified no later than June 23, 2014. We are grateful to Australia Copyright Agency Cultural Fund for their generous support of this program.